There is one house where the door is always open and welcomes everyone who walks through. It is the virtual doors of House of Bingo. And what a grand house it is for bingo lovers all over to congregate, socialize and play bingo. We ladies may truly love the color pink but House of Bingo has chosen to beat to a completely different bingo drummer by combining a variety of bright colors throughout the site. It is a design concept that works and tempts players to visit the house that stands out from all the others. The homepage is inviting and is very easy to navigate, information on games, promotions and help can all be found in the top navigation bar. 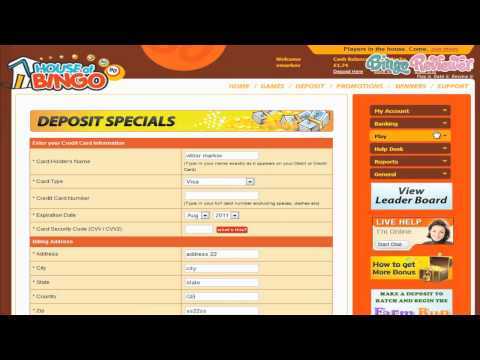 The homepage also contains useful information on the bingo games, instants and slots on offer. Signing up is snap with only your name, DOB and email address required. Once you have verified your email address half of the no deposit bonus is credited to your account, the other half once you have verified a future payment method. Games are powered by Cozy Games software and as their slogan says “the best games in town”, many players would adamantly agree. House of Bingo is part of the Fun Bingo Network and fully licensed in Malta. You won’t find 75 ball bingo here but they do offer 90 ball rooms and 80 ball rooms. It is a welcoming change from the standard games so often found. The chat hosts are entertaining as they cheer you on and helpful; if they can't help you can use the 24x7 live help menu. Each room comes equipped with a chat feature and a good range of Side Games and Instants that can be played during bingo sessions. There are a choice 40 slot games that offer a nice description of each including the number of reels, pay lines and bet range. Other games include Keno, Blackjack, Poker, Instant Games and more. They can all be played for bonus bucks or real cash and that is a real plus for players looking to play outside the bingo rooms. Play on your mobile phone while you are away from the site. It is a perfect alternative while you are out and about and have a few minutes to spare. House of Bingo knows how to treat visitors from the moment they step through the doors with a No Deposit Bonus offer. It as easy as 1, 2, 3 to claim literally! First register, verify your email and finally update your profile. It is as simple as that to be on your way to Free Bingo. The Welcome Bonus is ridiculous huge and is spread across the first three deposits. No worries because there is also Re-Load Bonuses and special offers happening all the time. The Monthly Offers are brilliant and correlate very nicely to the particular month at the moment. Look for Slot Tourneys where there is lots of real cash up for grabs for the top spinners. The Favourties is dedicated to all the ongoing promotions with Refer a Friend, Morning Glory and Trade Loyalty to Cash. It is truly a house warming party for all players with lively promotions and action packed gaming. Players are appreciated and generously rewarded with a great Loyalty Points structure. We rate House of Bingo with 4 Pink Hearts. Good easy to use web site. Not only does House of Bingo have fun bingo rooms but they have a good selection of slots and casino games. There’s a great selection of slots at this site! My favorite has got to be rolling in the dough. I tend to stick to this slot whenever a site offers it because I think it has some of the best jackpots I’ve seen. House of Bingo offers a great morning glory promotion that takes place during the early hours of the morning for a total of about four hours. During this time their specials are out of this world! You can get double the chat BBs for every game you play and double on bingo jackpots. I love playing when this promotion is going on and I often find myself staying up very late just to see if I can rake in some of the benefits. Everyone at the site has been very friendly and when I first signed up, they gave me £20 to start with, no deposit required! One of the more modern sites I have came across lately, and I must say I really love how they dd the whole thing, together with the sidebar. The site looks great on high resolution screen, and the navigation is easy and fast. They accept the regular array of payment methods, including the popular Neteller and Skrill, and I just have to check the payout time. At the moment, there are three Bingo rooms: 75, 80 and 90 ball games are represented. The 80 and 90 ball rooms are available 24/7, and the 75 ball room is available from 5pm to 1am GMT time. There is also a nice number of other games, total of 12 Casino games, 8 Scratch Card games and 60 Slots, all from the Cozy games portfolio, that is rather impressive. They have a £ 20 no deposit Bonus available, and that really made my day, almost as much as the fact there is a dedicated Mobile site, good to go with any mobile or tablet.